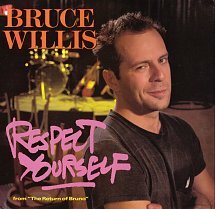 In 1987, Bruce Willis hopped on the actor-turned singer bandwagon, joining John Schneider, Eddie Murphy and Don Johnson. Willis was at the height of his Moonlighting role of David Addison when he recorded his debut album, The Return of Bruno. It was an R&B album that was released by Motown, and did pretty well. It peaked at #14 on the Billboard 200 album chart. A big part of that success was due to the single “Respect Yourself” which reached all the way up to #5 on the charts on March 7, 1987. The song was a remake that was originally performed by The Staples Singers in 1971. Bruno did a great job covering the song, but it didn’t hurt that June Pointer sang some verses with him. His follow-up singles “Young Blood” and “Under the Boardwalk” did not fare nearly as well, peaking at #68 and #59, respectively. However, “Under the Boardwalk” did well in the U.K. peaking at #2 there. Bruce Willis’ career skyrocketed the following year when Die Hard came out. The rest is history.